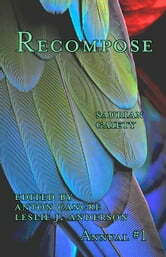 The first annual of literary speculative fiction magazine recompose. Collects issues #0-#3, featuring Alasdair Stuart, Nisi Shawl, Lucy A. Snyder, Ken Liu, Charlee Jacob, Seanan McGuire, Cat Rambo, Matt Betts, Jaymee Goh, Janice Leach, Sara Cleto, Brittany Warman, Kelly Stewart, Bruce Boston, Alessandro Manzetti, Katherine Heath Shaeffer, Andrea Corbin, T.D. Walker, Samantha Murray, Chloe N. Clark, Kurt Newton, Leigh M. Lane, Donald Illich, Phillip Brian Hall, Lyndsey Silveira, Jon James, Jenny Blackford, LaVa Payne, Erika Price, Andrea Kriz, Tamlyn Dreaver, and art by Courtney Vice.